The University will soon have a cutting-edge black box theatre. The new space will be used to create an acting conservatory program, the first of its kind in the city. In a few months, theatre students at the University of Ottawa will have new, ultramodern facilities: a “black box” theatre space called LabO and four classrooms centrally located downtown, a short walk from the campus. Work is well underway to prepare these spaces, part of a new complex on Waller Street adjacent to Arts Court that will also be home to the Ottawa Art Gallery. LabO is the centrepiece of the new facilities. It’s a huge, multiuse, perfectly square space that can easily be adapted to different artistic needs. As no side dominates, the space is highly versatile. Seating can be arranged for a frontal or traverse theatre, in a square or in the round. Seating can also be removed, which makes it possible to present immersive pieces where spectators must move through an open space. The project, produced in collaboration with the City of Ottawa, offers the Department of Theatre an unprecedented opportunity to introduce a new program, which will welcome its first group of students in fall 2019. 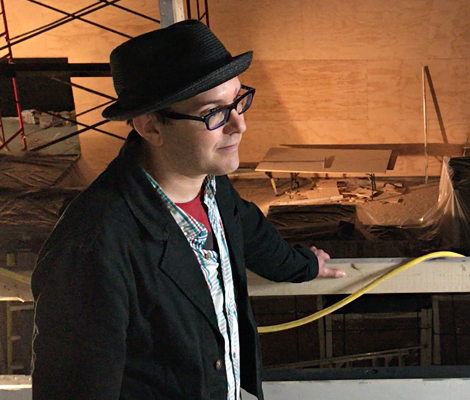 “It will be an acting conservatory, where we will train professional actors, while offering a solid education in dramaturgy and theatre history,” says department chair Sylvain Schryburt. A strong theoretical component coupled with intensive theatre practice will underlie teaching at the new conservatory. “Usually, theatre schools can’t offer this type of education, especially for francophones, because they aren’t located in a university setting,” says Schryburt. Currently, Ottawa is the largest city in the country without an acting conservatory. The one at uOttawa will not only strengthen the local theatre scene, but also help it grow, the theory being that alumni will be more likely to stay in the region, develop projects and make a career here. It’s a big step forward for theatre in Ottawa, which will now be better positioned nationally. What is the University of Ottawa acting conservatory? A curriculum made up of acting, voice and diction courses, as well as workshops on stage fighting, on-camera performance, acting and multimedia, and much more. Two language groups co-existing side by side with very different theatrical traditions, including styles of acting and playwriting. This is a distinct quality of the uOttawa acting conservatory's teaching and identity. A latticed catwalk running along the ceiling of the hall where projectors and other other objects can be hung … even cars! The first theatre in Ottawa with full LED lighting. Four rehearsal studios, including two with floor to ceiling windows and floating flooring that can accommodate a dance troupe. A small studio for teaching technical theatre, including how to hang lighting and make electric circuits. This room can also host small shows. A control booth designed like a classroom that can hold 18 students. Classes can take place with the audiovisual equipment during productions. Over the years, strong links have been forged between the Ottawa arts community and the University. Many artists rent facilities from the University to work in or put on shows. LabO’s neighbours will be visual artists, dance and theatre companies, and art galleries. The University is looking to form partnerships with them to make them part of the teaching and creative work at the conservatory.